With the change in ownership and the re-purposing of one of America’s best known hotels, I am re-posting a review of a very different book than the others I have read by Stanley Turkel. While it follows much of his same incredible attention to detail on the history of hotels (including a continuing commitment to accuracy) , this book focuses almost entirely on a very focused period of time, on a few people who made a difference in American hotel keeping and on one very famous hotel in the largest city in America. Lucius Boomer was chairman of the Waldorf-Astoria Corporation. Turkel explains in great detail about his noted career of managing or overseeing a number of major hotels in the northeast part of the USA from the early part of the 20th century through the 1940s. George Boldt is a lesser known, but important player in American hospitality and Turkel highlights the emphasis on service, grooming, standards and systems that Boldt introduced and maintained in his time (through 1916). Oscar Tschirky, or Oscar of the Waldorf as he was mainly known, is perhaps the best known of the three to the consumer or non-hotelier, as his tenure and flair at the famous hotel for a half century was well chronicled at the time and later via several food dishes named in his honor. Turkel is an acknowledged authority on the history of New York City hotels, including both those that remain in existence today and those that have been converted or demolished. I considered it a sincere privilege to read and review Turkel’s earlier book Built To Last: 100+ Year-Old Hotels in New York , which was a fascinating read for anyone interested in history, building design and hospitality. The collection of historic properties that Turkel chose for that book featured 32 distinctively different properties. Some of them are well known such as the Plaza and the St Regis hotels, but most of them are less well known but just as interesting as they evolved from their original design and market positioning.Author Turkel was designated as the 2014 Historian of the Year National Trust for Historic Preservation and Historic Hotels of America in October, 2014 at their Awards Conference at the Hotel Hershey, Hershey, Pa. , for his zealous devotion to communicating the role of hotels in American business and life. 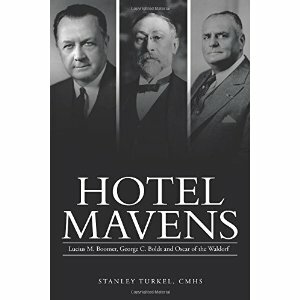 Hotel Mavens continues Turkel’s thorough sharing of this information through documented details about many well known American hotels – the Lenox in Boston, the Bellevue Stratford in Philadelphia, the Willard in Washington DC and many in New York City including the Claridge, the Sherry Netherland, the Plaza (briefly) and more. He explains how the Intercontinental Hotel Corporation came to be and how so many famous people and hotels came and went over a 50 year period. In some places, this book is not always easy to read, and that is due to the evolution of language used 100 years ago that is included in this book. There are diagrams and communications from the early Waldorf-Astoria days and a good number of black and white photos that bring the stories to life. He shares anecdotes and real-life stories that became standards in the industry, while others became dated and did not have staying power. The Epilogue section of the book comes directly from the Waldorf-Astoria archives. As far as author Turkel knows, it has never been publicly reported before. Historically, it reveals unique material about the operation of the original and current Waldorf-Astoria hotels. For anyone interested in hotel operations from 85 years ago, it is chock full of revealing and fascinating material. Hotel Mavens includes a good amount of material that is presented as and when it was written, which was sometimes a century ago. It refers to the attention given to foreign royalty and celebrities of the day at the Waldorf-Astoria and other hotels to the point of almost “drooling” over their importance. The condensed chronology from 1890-1929 includes information regarding the guests, famous and infamous who attended various functions at the hotel. One might think this dated, yet the social media and paparazzi of today do the same things with the names and faces in the news today. The stories of how hotels were built, leased, sold, changed in function and more show how many of today’s business practices evolved. I should also add an observation that in some places, the time line sequences do not flow easily to even a reader such as myself who is aware of at least some of the hotels’ histories or people. To someone who does not have a background in the industry, it might appear unintentionally vague or a bit confusing in places. Story lines and communication taken from the early days of the Waldorf-Astoria sometimes do not translate clearly in meaning as the language used today, which may cause a reader to be a bit puzzled at times. Hotel Mavens is definitely worth reading and I recommend it to anyone who has an interest in the history of old New York, of how the hotel industry in America was influenced by big city hoteliers and investors and to anyone just interested in how life in New York City might have been before air travel, interstate highways, conventions, casinos and during Prohibition. John J. Hogan, CHA CMHS CHE CHO is a career hotelier, author and educator who has held senior leadership with responsibility in several organizations involving operational, academic and entrepreneurial enterprise. He has been affiliated in management roles with Sheraton, Hilton, Dunfey (now Omni), Park Suite (now Embassy Suites), Med Center Inns of America, Best Western world headquarters and independent properties. He taught as an adjunct professor for more than 20 years at 3 different colleges and conducted more than 5,000 classes and workshops in his career as of 2016. He is Co-Founder and Chief Learning Officer of HospitalityEducators.com, which was founded in 2010 as a solutions center for hotel owners and managers. 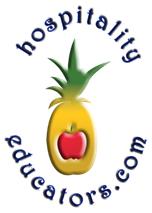 HospitalityEducators.com completely updated and has been facilitating the Certified Hotel Owners program for AAHOA since 2012, with a participant approval rating of over 97% and more than 1400 certifications to date. As the principal of Hogan Hospitality, he has provided litigation support, hotel expert witness services and hotel owner support services. He holds a number of industry certifications and is a past recipient of the American Hotel & Lodging Association’s Pearson Award for Excellence in Lodging Journalism, as well as operational and marketing awards from international brands. He has served as President of both city and state hotel associations and as an elected Chair of a major brand Hotel Owners Council. He is currently working with his partner Kathleen Hogan and others on several new projects including the HOTELIERMASTERMIND series, an eBook series with Howard Feiertag on hotel sales, two new web sites and a fresh set of Keynote and Workshop programs, hospitality services and columns. He writes regular columns for a number of global online services, has published 500 columns and 225 blogs for industry publications. He co-authored (with Howard Feiertag, CHA CMP) LESSONS FROM THE FIELD – a COMMON SENSE APPROACH TO EFFECTIVE HOTEL SALES as well co-authoring the Supervisory Skill Builders from the Educational Institute. Hogan’s professional experience includes over 43 years in operations, service, sales & marketing, training, management development and asset management on both a single and multi-property basis. He has supported numerous industry boards that deal with education and/or cultural diversity for more than 15 years. He served on the AH&LA Certification Commission of the Educational Institute and as brand liaison to the NAACP and AAHOA with his long term involvement in the Certified Hotel Owner program.